“The NFL advised James to stay in school. I agree with the NFL, but in any case we wish James the very best of luck with his future,” – Washington State Head Coach Mike Leach. When your former college head coach and the professional league you plan to leave for is telling you to stay in school, you know the odds are stacked against you. However, running back James Williams is a unique prospect that I have since dubbed one of my earliest off-season crushes. He has an impressive skill set and I think if he can find the right offensive system he could be a success at the next level. If you were to ask for a general consensus for the top rookie dynasty wide receivers, the Top 5 will probably look very similar to this: N’Keal Harry, D.K Metcalf, Kelvin Harmon, Hakeem Butler, and A.J Brown. 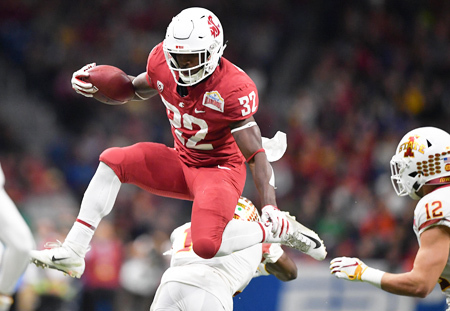 But what if I told you that James Williams caught more balls in his three-year career at Washington State than all but one of those names. That’s right, N’Keal Harry (213 catches over three years) is the only kid on that list with more catches than James Williams. 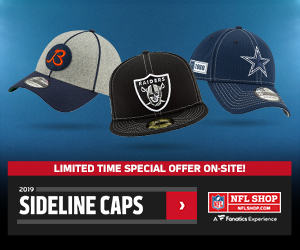 Williams recorded 202 receptions over a three-year span whereas DK Metcalf (67 catches across two years), Kelvin Harmon (177 catches over three years), Hakeem Butler (110 catches over three years) and AJ Brown (188 catches over three years) all fell short. Williams is far and away the best receiving back in this class, and this crazy stat proves that it’s really not even that close. As stated above, Williams’s obvious strength is his pass catching ability. In 2018 he finished second in PAC-12 in receptions with 83. That’s more than N’Keal Harry’s 73 receptions in 2018, who just so happens to be my 1.01 as it stands. Pretty impressive. Williams wasn’t just relegated to short swing passes and screens. He’s a solid route runner who runs clean routes like you’d expect to see out of a wide receiver, not a running back. He high points the ball on jump balls and showcases great body control and awareness near the sidelines on his downfield targets. He is no slouch in the rushing game either. He didn’t have as many attempts as some of the other top backs but on the attempts, he did have he impressed, while also showing a knack for the end-zone. 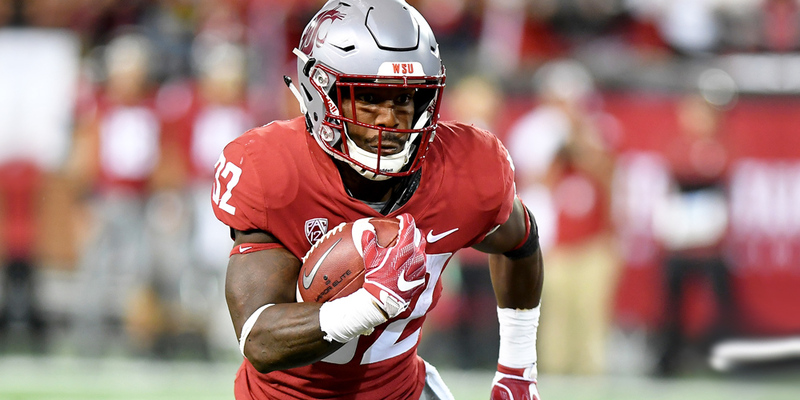 In 2018, Williams took 122 carries for 526 yards (4.6 YPC) for 12 touchdowns which was good for second in the PAC- 12. Eno Benjamin out of Arizona State finished first in that category with 16 touchdowns but it took him 300 attempts to do so, which is 178 more opportunities than Williams had, all to score only four more touchdowns. Williams is a tough runner between the tackles who showcases great vision. According to Pro Football Focus, Williams finished first in not getting tackled on first contact among all draft eligible backs. He did not get tackled on first contact on 44.3% of his runs, meaning nearly half of his runs he broke through first contact….insane. Williams also finished Top 10 in elusive rating according to Pro Football Focus and possesses an elite spin move that he consistently burned would be tacklers with. Where Williams falls short is his lack of breakaway speed. His longest career run is only 43 yards, evidenced by his rather slow 40 yard dash time of 4.58 for a 5’9 197 pound back. I’m not one to look into a slow 40 time too much unless it’s a sluggish 4.78 like Elijah Holyfield, because the positive tape on Williams will prove otherwise. He’s not going to blow you away with big plays like Darrell Henderson, but he’s also not going to get consistently stuffed at the line. He’s not going to project as a three-down back right away due to his poor pass protection. It is definitely a weakness he will need to work on to work his way onto the field and earn more snaps. Leonard Fournette is not exactly in the good graces of the coaching staff. All parties are saying they have resolved their differences but I’m not fully buying it. The Jaguars are in need of a back behind the injury prone and character concerning Leonard Fournette with the departures of TJ Yeldon and Carlos Hyde. The Jaguars would be smart to scale back Fournette’s workload to preserve him for the season and James Williams would be the perfect complement. He can give Nick Foles a safety valve for a team devoid of a legitimate Tight End option. If Fournette were to go down or get suspended, which is likely, Williams would fill in admirably for him and get his chance to showcase his skills at the NFL level. How serious is Todd Gurley’s injury? It’s a gray area right now with a lot of misinformation being spewed by all sides. CJ Anderson is a free agent and may or may not re-sign with the team leaving unproven Malcolm Brown as the only other option at the backup running back spot. This would be a dream scenario for James Williams to step in as the RB2 for Sean McVay and the Rams, in a world where having two capable backs is almost a must. He would give them a dynamic pass-catching option to pair with Gurley and take some carries off of his plate to preserve his health. The Buccaneers would give James Williams perhaps his best chance at the largest role. The Bucs re-signed plodding started Peyton Barber and have Ronald Jones entering a make or break year with Bruce Arians, who is inheriting him from the Koetter regime. So there’s not exactly a locked in starter as there are with the other teams on this list. Williams would step right in as the third-down back and receiving option in an explosive offense with an opportunity to take over the lead role with a good camp and Pre-Season. The Bucs scheme will play perfectly into Williams rushing style with playmaking weapons at all levels of the field, which will open up room for him to run. Lamar Miller is criminally undervalued year after year, but the Texans would do good for themselves to get a guy like James Williams in the building. No one knows how D’onta Foreman is going to look coming off his Achilles injury, leaving the backup spot a bit of a question mark. James Williams’s do it all style will mesh perfectly with Deshaun Watson. Having Williams’s spatial awareness and ability to get open to checkdown to when scrambling out the pocket will be super beneficial to Watson’s success. Plus, Lamar Miller is getting up there in age and would operate best in a timeshare with a guy like Williams. Honorable Mentions are Green Bay Packers and Philadelphia Eagles. It has been proven that targets are worth more than carries in fantasy football. Expected points per target are almost double that of expected points per carry, especially in PPR. This is why most of the top guys all have receiving chops because targets equal fantasy points. So if Williams lands in the right spot where he can get a good amount of targets along with some carries mixed in, he could become a very valuable asset for your dynasty team at a relatively cheap price. Let’s not forget his knack for the endzone he showcased in 2018 on limited carries last year as well. It’s not out of the question he could become a sneaky successful red zone weapon like Corey Clement was for the Eagles in their Super Bowl year. As it stands, James Williams is my rookie running back #9. You can expect him to go anywhere from the early third to late fourth depending on the general knowledge of your league mates. You may be able to snag him in the late 4th if you play with guys who don’t really know what they are doing, but if you have some guys who know their stuff, you may have to go get him in the third round. Williams is very dependent on his landing spot because he does not project as a featured back to start, so we need to keep a close eye on his landing spot. But if the landing spot is sweet, go ahead and get your upgraded James White before it’s too late.